Disclosure: Warner Bros. Home Entertainment provided me with a Blu-ray™ Combo Pack & DVD movie pack to facilitate this post. The opinions I share are my own. If you are a Nancy Drew fan, you are going to love today’s post! Mystery has met its match because the iconic mystery solving teenager from the classic Nancy Drew books is back with an all-new feature length film that will keep you guessing until the very end! I was happy to give away a Nancy Drew movie swag pack last month and I’ve partnered with Warner Bros. Home Entertainment for another giveaway! Read on to learn my thoughts on the movie and to enter. 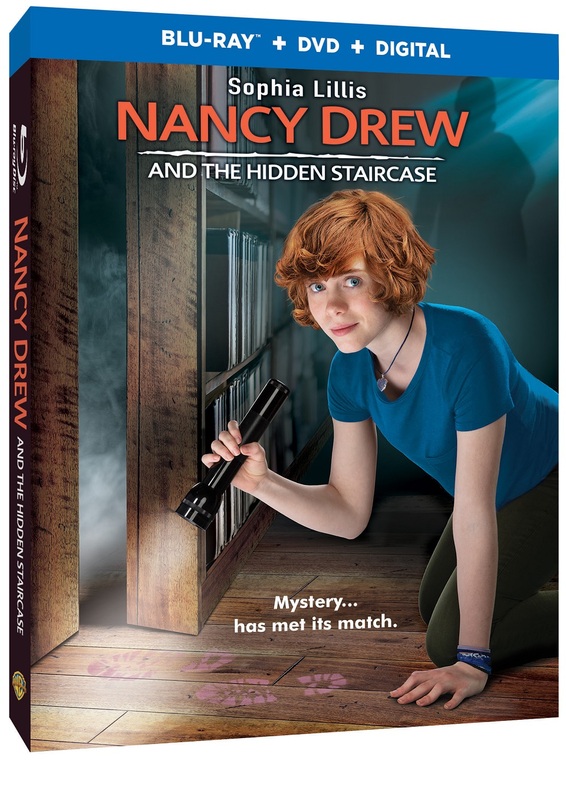 Warner Bros. Home Entertainment released Nancy Drew and the Hidden Staircase on Digital starting March 26, 2019 and Blu-ray™ Combo Pack & DVD on April 2, 2019. Executive Produced by Ellen DeGeneres, the film stars Sophia Lillis (IT and “Sharp Objects”), Sam Trammell (“True Blood” and “This is Us”), and Linda Lavin (“The Good Wife” and “Alice”) and follows Nancy Drew in her new town, making new friends and on a mission to solve the case! The movie starts with Nancy showing her mad skateboarding skills down the center of Main Street in the sleepy little town of River Heights. It looks like the perfect all American small- town, complete with pretty shops and well-manicured lawns, but there is an undercurrent to all that perfection. Nancy longs for excitement and it doesn’t take her long to find it! She gets herself in hot water again with her Dad and the law as she helps a bullied girl get even. Did she go too far this time? You’ll have to watch the movie to find out what happens. Here’s a clue for you though, if you like The Smurfs; you are going to love this part of the movie. Things really pick up once Nancy finds herself embroiled in ghostly activity at the Twin Elms mansion right beside their high schools mean girl Helen, and her Aunt Flora. Nancy loves a good mystery and helps them figure out all the creaking floorboards and exploding light bulbs. 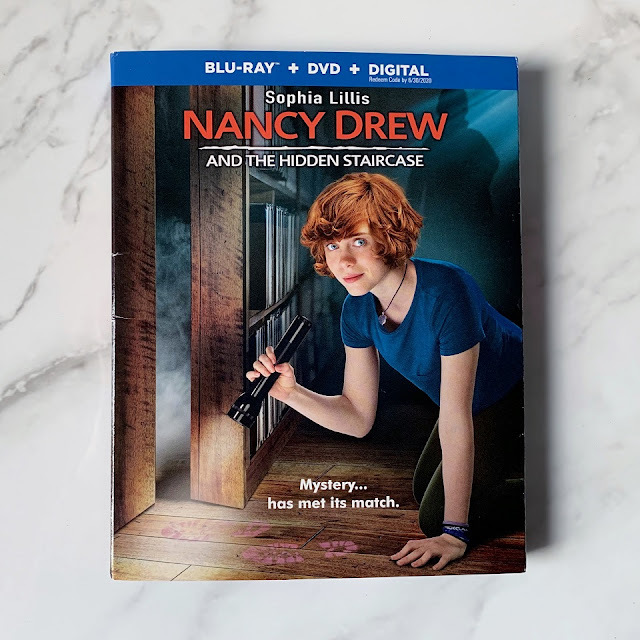 Nancy Drew and the Hidden Staircase is a uplifting movie I think you’ll enjoy on family movie night; especially if you have tweens or teens! The movie is a bit predictable, but since it’s only an hour and half long, it goes by quickly with loads of fun along the way to keep everyone entertained. The cast does a superb job in their roles, most notably veteran Linda Lavin as Aunt Flora and "iT" star Sophia Lillis Nancy Drew. I enjoyed watching them bring this movie to life. Check out the movie trailer to see them in action. Want to test your sleuthing skills? Play the fun mystery game below. Here’s another clue for you: play to win by sharing how you did in comments! Welcome to the Interactive Nancy Drew Escape Room - to escape, you must solve riddles and find items to uncover the three numbers needed to open to door. In the Mystery Match Video Puzzle, use your mouse to click + drag puzzle pieces to unlock clips from the film. Thanks to today’s sponsor, Warner Bros. Home Entertainment, one lucky reader will win one Nancy Drew and the hidden Staircase Blu-ray™ Combo Pack & DVD movie set. Please read all terms below before entering. No purchase is necessary to enter using the Rafflecopter form below. Must live in the United States and be 18+ or older to enter. Must use a valid email address to enter. Sorry, we can't ship to P.O. Boxes. One winner per household only. My WAHM Plan is not responsible for prize fulfillment, the sponsor is. Winners will be notified by email used on the entry form and have 48 hours to respond or another winner will be chosen. This giveaway is not associated with nor endorsed by Facebook, Twitter, or any other social channel. 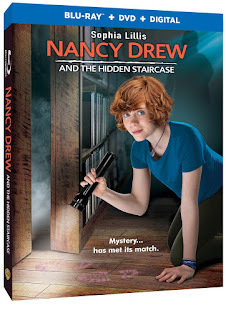 Each household is only eligible to win Nancy Drew and the Hidden Staircase Blu-ray™ Combo Pack & DVD movie set via blog reviews and giveaways. Only one entrant per mailing address per giveaway. If you have won the same prize on another blog, you will not be eligible to win it again. Winner is subject to eligibility verification. Please share in comments: How many tries did it take you to get all three clues in the mystery match game above? Would love to watch this delightful movie! I am a super sleuth! I got through it in about 2 mins, one of them was harder to find than the others. It was fun though. It took my about two and a half minutes. An amusing game, thank you. Very fun and interesting. Completed.